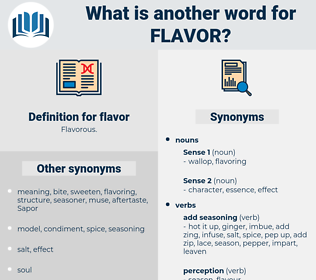 What is another word for flavor? smell, coloring, palatability, style, character, colour, mei. 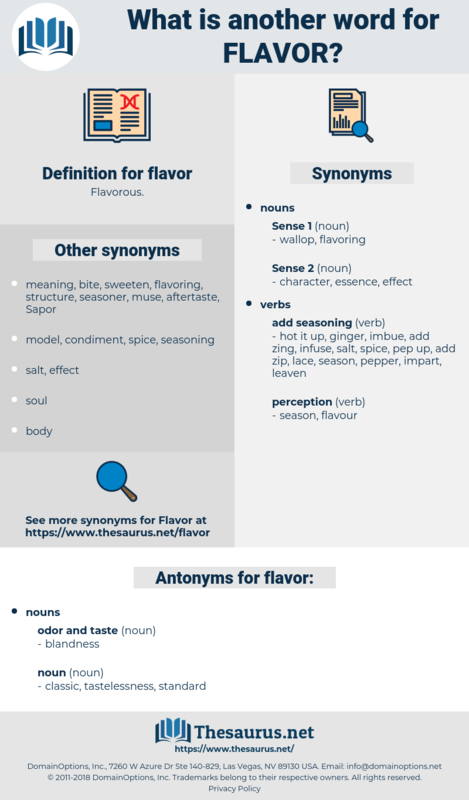 aroma, perfume, fragrance, flavouring, scent, color, characteristic, characteristics, liking. This did not give him enough to satisfy his craving, but it did create in him an intense distaste for it by constantly keeping the flavor before him. How pleasant the flavor of the oily peach brandy, how genial the blaze of the hickory logs, how good to hear the rich voices and the slight accent, as they called over familiar names and faces, and told me the valley news! sauce, resinate, spice up, salt, spice, savour, savor, curry, zest.